These clubs are in good condition. I would give them a 7.5 out of 10. • Increased Forgiveness from the precise placement of dense tungsten sole weights in the stainless steel club head.• Greater Ball Speeds on hits outside the center of the clubface.• 4 percent more forgiving longer irons because of a higher MOI.• Progressive size with reduced blade length from long to short irons.• Tuned cavity insert provides positive feedback and feel.• Improved Appearance from address, with a beveled top line and classic look. I've heard a lot about this club but I didn't want to give up my forged Mizuno MX-23's. I decided to try them when I lost enough club head speed to use graphite senior shafts. Everything I heard about the AP1 712 is true. They're a players club for slower swing speeds...especially with the graphite Tour AD senior shafts. 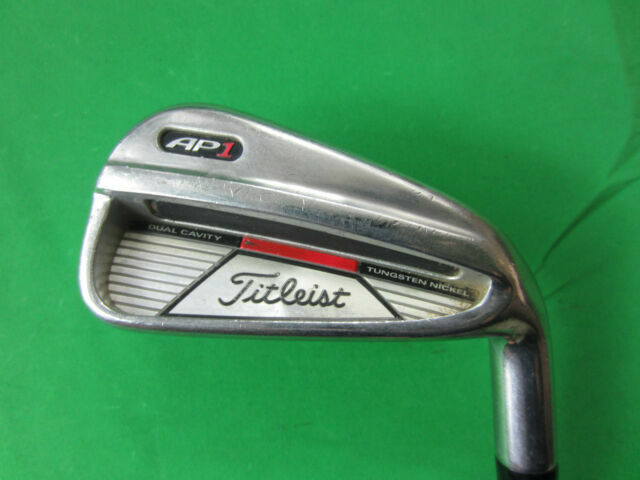 I like the looks of the Titleist AP1 712 the best of all the AP1's. So far I am still getting use to the change from my other irons. I hit the W and PW real good and hope that the longer irons get honed in also. Long irons are not my favorite clubs to hit. The W and PW feel super when hitting those clubs. The future will tell the rest of the story. Love them soo much I have two sets - one for home and one for vacations. Golf club manufacture has become so competitive and strong that selecting irons has become a matter of feel or taste rather than quality. Nonetheless, I believe Titleist AP irons (both AP1s and AP2s) may be the finest irons made today. I lost my AP1 7 iron and bought a used one on Ebay. Now I have a full set of performance irons designed for the better player (my USGA handicap index is 6.2). I would recommend Titleist irons to anyone with a sincere interest in improving their golf game. Great product. Yes you can buy a better game. I have been an avid golfer for 35 years. However I could never justify owning a quality set of clubs. Mostly in the $350 to $400 price range. Don't get me wrong other people make quality stuff, but not every make fits everyone's golf game. Titleist is the ultimate golf club. I immediately took 8 strokes off my game. The one drawback. The Graphite Flex lets me hit shots so much longes and higher, I am taking a long time to figure out clubs for the distance. The were recommended to me by a former employee of Titleist, also my coach and he sure knows his stuff. I purchased sets for both of my son's and they wouldn,t trade for anything else.